���� Thus concludes the opening screen scroll of All Quiet on the Western Front, giving ample warning, even to those not familiar with the book of the same name or the masterful 1930 film by Lewis Milestone, that this is not a film glorifying war. Indeed, with Kubrick�s Paths of Glory (1957), the original All Quiet on the Western Front are two of the most powerful anti-war films ever. This made for TV version is not in that league, but it is still a well acted, well made and moving indictment of the futility of war. ���� Urged into a patriotic fervour by their school professor (Donald Pleasence), six friends from the graduating class of 1916 volunteer to join the German army to fight in France. They are Paul Baumer (Richard Thomas), Josef Behm (Mark Elliott), Albert Kropp (Dai Bradley), Fredrich Muller (Mathew Evans), Hans Kemmerich (George Winter) and Peter Leer (Dominic Jephcott). They are young and idealistic, ready to fight and die for the Fatherland but their enthusiasm is tempered first by some sadistic basic training under Corporal Himmelstoss (Ian Holm) and then, on the way to the front, by seeing a trainload of wounded and bloodied soldiers unloaded. At the front, they are fortunate to fall under the wing of veteran soldier Stanislaus �Kat� Katczinsky (Ernest Borgnine) who teaches them the skills that may allow them to survive the slaughter in the trenches, at least for a time. ���� In the mud and blood of the rat infested trenches, disillusionment and causalities mount despite some time away from the front line. When Kemmerich is killed and Paul and Kropp wounded, Paul spends time in hospital recovering and is granted home leave to visit his family; yet there Paul suffers from the unreality of the expectations and ignorance of the conditions at the front by those back home. Visiting Kemmerich�s mother is also a painful experience and Paul cannot wait to return to his friends at the front. As the combatants find more and more inventive ways to kill each other, including shells, poison gas and flame throwers, and the war drags on, survival even for the most experienced soldier seems a fantasy, and death a reality few can avoid. ���� Filmed mainly in Czechoslovakia, All Quiet on the Western Front for a TV movie has a cast of �name� actors including Ernest Borgnine, Donald Pleasence, Ian Holm and Richard Thomas who give excellent performances, with both Borgnine and Thomas being particularly outstanding. With its PG rating, there are no severed limbs, gore or exploding heads, but within this constriction the film does a good job of depicting the grotesqueness of trench warfare; the mud, the corpses, the poison gas, the rats and the terror. The action scenes of soldiers attacking across a wasted landscape of mud, shell holes and wire, or of artillery bombardments in ruined, blasted villages, are tense and well done. ���� This TV version of All Quiet on the Western Front was originally screened with a running time of over 150 minutes, however previous releases on DVD in Regions 1, 2 and 3 contain an edited version of the film. Our Region 4 release had a running time of 122:58; it was reviewed in this site here. Now, with this Blu-ray, we seem to have the complete version of the film including two scenes immediately after the medal ceremony, one involving a discussion about the reasons for the war while Himmelstoss listens, the other comments about a girl in a theatre poster while later a scene of Paul carrying Kat to the dressing station is back in the Blu-ray. ���� This made for TV version of All Quiet on the Western Front is a well acted, well made film containing a moving and powerful indictment of the futility and soul destroying nature of war. And, at last, on this Blu-ray we seem to have the full version of the film. It is well worth getting, and even if you have purchased this film before on DVD this Blu-ray is definitely worth the upgrade. ���� Note: The Blu-ray commences with a montage of ITV Blu-ray releases lasting 1:30 that cannot be skipped or fast forwarded. I found this extremely annoying. �����All Quiet on the Western Front is presented in a ratio of 1.33:1, the original ratio, in 1080p. This is a 30 year old made for TV film so it is not as sharp as a modern film, nor should we expect it to be. However, contrast, shadow detail and blacks were very good. The review of the previous DVD release indicated that the colours were overbright on occasions, the skin tones tended a little red, there was aliasing, numerous film artefacts and a hair or two on the print. ���� I am happy to say that these issues have been corrected in this Blu-ray. The colours are drab, in keeping with the period and context of the film with natural browns, greys, faded yellows and drab greens prevalent. Skin tones appeared natural, if a bit on the light side. While there was an occasional small mark, it passed by very quickly, I noticed no aliasing or other significant fault. All in all, a good clean print, probably better than the film has looked for years. ���� The English subtitles were in a clear white font. I did not notice any grammatical or spelling errors in the portion I sampled. ���� Audio is an English Dolby Digital 2.0 mono. This was the original audio. While the audio has not been upgraded to a surround, it does seem to have been improved, as the DVD review noted the audio was tinny. Clearly, while there is no surround or subwoofer use, the sound has been beefed up. The dialogue is clear and, although not earth shattering, the explosions and gun shots now have more depth and, for a TV movie, don�t sound too bad. ���� The music by Allyn Ferguson is neither memorable nor distracting but gets the job done I suppose. Behind the Scenes: 68 colour and black and white stills. General : 80 colour stills. Key Shots & Artwork: 22 colour stills. 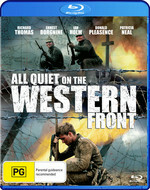 ���� As noted above, there have been various Region 1, 2, 3 and 4 DVD releases of All Quiet on the Western Front. None have any extras, and only the Region 3 Thai release is reported to include a Dolby Digital 5.1 audio. All the others, including the previous Region 4 DVD release, had Dolby Digital 2.0 audio. As far as I can tell, these versions all contained the edited version of the film. ���� This Blu-ray is a vast improvement over the DVD on all levels. The Blu-ray includes the full 156 minute version of the film, the video has been cleaned up and the sound improved and while extras are limited to stills, at least there are some. Our Blu-ray is coded Region B, and in fact is identical to the Region B UK Blu-ray down to the ITV logo and forced advertising for other ITV Blu-ray releases. I could not find a Region A Blu-ray release of the film at this time. Stick to the local release. ���� Along with Kubrick�s Paths of Glory (1957), the original All Quiet on the Western Front (1930) by Lewis Milestone are two of the most powerful anti-war films ever. This made for TV version of All Quiet on the Western Front is not in that league, but it is still a well made and moving indictment of the futility and soul destroying nature of war. ���� Unlike previous DVD releases, this Blu-ray seems to have the full version of the film. The video and audio are good, and a definite improvement over the DVD, and we do have some extras. Even if you have purchased this film before on DVD this Blu-ray is definitely worth the upgrade. Display LG 42inch Hi-Def LCD. This display device has not been calibrated. This display device is 16x9 capable. This display device has a maximum native resolution of 1080p.